if you thought week 1 was good, which it was with phenomenal finishes in the UCLA-A&M and Tennessee- Georgia Tech games depending on your perspective, week 2 looks even better with some marquee matchups featuring some of the better teams in the country going head to head. Here's a look at the action this week. Auburn had a relatively easy time of it last week at home with a 41-7 victory over Georgia Southern. The defense played well, Auburn ran the ball well, but Jarrett Stidham had mixed results. He fumbled a couple of times and threw an interception, so not too swift. The Clemson defensive front is massive, physical and dominating. The question for me is, can the Auburn offensive line handle the likes of defensive tackles Christian Wilkins (6'4", 300) and Dexter Lawrence (6'4", 340). Defensive end Clelin Ferrell is a tough one too at 6'5", 250. Braden Smith and the rest of the Auburn front will have to step up in this game to open holes for Kamryn Pettway, Kam Martin and rest of the Tigers' running game. Kerryon Johnson has a hamstring injury, so he's questionable. He might be available, but it'll be hard with a hamstring. Stidham will have to perform in the passing game. He needs to find Nate Craig-Myers and the other receivers. Craig-Myers had a quiet game last week, but he's big play guy if Stidham can get him the ball. Clemson's offense was outstanding last week in a 56-3 victory over Kent State, though the opponent didn't test the Tigers offense much. Auburn's defensive front with Marlon Davidson and Derrick Brown are very formidable as well, and linebacker Tre' Williams is a leader on the defense and a very good player. So I like defense to be more of the story in this game. Kelly Bryant had a good game at quarterback for Clemson last week, and he has plenty of playmakers to help him out. But this is not going to be a shootout. The trenches will decide this one. It'll be tight, but I like the Clemson Tigers in a close game at Death Valley . The Crimson Tide won a highly physical game against Florida State last week, but paid a price losing linebackers Christian Miller and Terrell Lewis for the season. Rashaan Evans has a groin injury and Anfernee Jennings is out with a sprained ankle. So the Tide is thin at linebacker this week. Da'Shawn Hand moved back to linebacker from defensive end to help with depth. Alabama still has plenty of talent to handle Fresno State. Fresno State defeated Incarnate Word, an FCS school, 66-0 last week, so they have some firepower offensively, though the FCS school didn't provide much resistance. The Crimson Tide can still play exceptional defense and special teams, except for the kicker, and will run the ball well with Damien Harris, Bo Scarbrough and Najee Harris, but offensive coordinator Brian Daboll, quarterback Jalen Hurts and the offensive line need to get better if the Crimson Tide wants to go far this season. Tua Tagovailoa should play this week, and if Hurts struggles again, could become interesting going forward as an option if Hurts can't get it together. Like the Crimson Tide to play well this week in all 3 phases and take care of business. The Fighting Irish looked pretty good last week in a 49-16 victory over Temple. The Dawgs took care of business in Athens with a 31-10 victory over App State, in what looked like a dangerous opener for them. Fighting Irish quarterback Brandon Wimbush is an electric player, and running back Josh Adams is big with speed, he's a good back. But I like Kirby, Nick Chubb, Sony Michel and freshman quarterback Jake Fromm, who I like a lot in Jacob Eason's place, to take care of business and pull off the slight upset in South Bend. Georgia keeps trending well with a huge victory over the Fighting Irish. Should be a super game. The Horned Frogs and the Hogs had easy first games, but this will be a test for both squads in quite a matchup in Fayetteville. TCU features quarterback Kenny Hill and an explosive offense with a much improved defense under coach Gary Patterson. The Hogs were victors at Fort Worth last year, 41-38, in double overtime. Austin Allen is very good under center for the Hogs and they feature a solid run game. The defense is still a question mark. I like this to be tight, but I see the Horned Frogs pulling it out. Better defense this year for Patterson. Memorial Stadium/Faurot Field, Columbia, Mo. Both teams had very good results on offense last week, but not so much on defense. South Carolina outlasted N.C. State, 35-28, and Missouri exploded on offense while imploding on defense in a 72-43 victory over Missouri State. I like Muschamp and quarterback Jake Bentley to pull off the slight upset in Columbia. OU looked explosive offensively, albeit against UTEP in a 56-7 victory last week. Baker Mayfield only played a half and threw 4 touchdown passes. Ohio State struggled for a while at Indiana before pulling away 49-21. I like the experience in coaching here. Though I'm not always that sure Urb is that great, he has the edge on 33 year old first time head coach Lincoln Riley. Mayfield gives OU a shot, but he's not enough to get the Sooners over the top. Buckeyes are victorious at the Horseshoe. Stanford was explosive in their first game in Australia with a 62-7 victory over Rice, but that was against no competition. USC struggled with Western Michigan, which returned 16 starters from a New Year's Six Cotton Bowl team a year ago, so that's not that disappointing. SC won 49-31 pulling away late. Some prognosticators are picking Stanford to upset the Trojans, but I like quarterback Sam Darnold and the Men from Troy to get it done in LA. I was impressed with the Blazers in their spring game, but not as much in a 38-7 victory over Alabama A&M last week at Legion Field. Ball State gave Illinois everything they could handle last week on the road, losing 24-21, so I like the Redbirds to take care of business over the Blazers. Oklahoma State shellacked Tulsa last week, 59-24, and South lost at Ole Miss, 47-27. But I like the Jaguars to snap back at home and give the Cowboys a good game, though I don't see them winning. Fourth year coach James Franklin has brought the Penn State football program back to prominence, and this 2017 team has the talent and drive to be even better than the 2016 Big Ten Championship team. In his first year, Franklin went 7-6. Year 2 was 7-6. But last year his plan came together as the Nittany Lions finished the season 11-3, beat Ohio State at home, won the BIg Ten Championship over Wisconsin, and played, what in my opinion, was the most riveting bowl game of the 2016 season, a heartbreaking 42-39 loss to USC in the Rose Bowl. That heartbreaker and the fact that the Nittany Lions were not selected for the college football playoff, even though they defeated Ohio State and won the BIg Ten championship, were painful but also motivating. Ohio State showed why they didn't belong in the playoff as Clemson blasted them in the Fiesta Bowl semifinal game, 31-0. Those two things have made this 2017 Nittany Lions team even hungrier for more. They've got to navigate some challenging opponents in the Big Ten, but they have a talented squad capable of putting together a terrific season. The main guy for Penn State and the Rolls Royce of this football team is running back Saquon Barkley. Barkley is back for his junior season after putting up stellar numbers as a sophomore. Barkley ran for 1,496 yards on 277 carries, a 5.5 average, with 18 TDs, and an average of 106.9 rushing yards per game. Barkley is also a heckuva receiver out of the backfield as he caught 28 passes for 402 yards and 4 TDs in 2016. He's a stellar overall weapon. I don't like talking about the Heisman Trophy much in August, really not until late October-early November, but everybody else does, and this guy is certainly a main part of the discussion. He'll have to prove it this fall, but if his work in the offseason indicates what kind of player he'll be in 2017, he should have an outstanding junior season. Barkley dropped his 40 time to 4.33 and has gotten his weight up to 230. He's 5'11". For this team to really excel, Barkley needs to have another exceptional year. And that is expected. And there is good depth behind Barkley. Miles Sanders, 5'11", 215, Andre Robinson, 5'9", 223, and Mark Allen, 5'6", 180, are all excellent backups, capable of giving Barkley a breather, and churning out yards and getting into the end zone in their own rights. Sanders didn't play in the spring game, but the Nittany Lions are high on him. Allen, who's smaller stature-wise, was impressive with his quickness and his pass catching in the spring. He's a good player. Robinson caught a 10 yard TD out of the backfield in the spring game. All solid players. Quarterback Trace McSorley, 6'0", 195, is back for his junior campaign as well. McSorley, a redshirt junior, is a super runner, solid passer and good leader for this offense. He started all 14 games last season, and completed 224-of-387 passes, 58%, for 3,614 yards, and 29 TDs against 8 interceptions. Franklin and offensive coordinator Joe Moorhead want more improvement in his accuracy, but there's a lot to like about McSorley. Backup Tommy Stevens is outstanding as well. The 6'5", 228 pound sophomore, had a heckuva spring game, completing 17-of-24 for 215 yards and 3 TDs. He can really sling it around. His deep ball is very accurate. The wide receiver and tight end positions are close to being totally loaded. Franklin may need to develop the 2017 signee to really solidify a full arsenal of playmakers, along with his 2018 class, which is ranked 3rd in the country by 247 sports, but he's got a pretty explosive group right now. Tight end Mike Geseki, 6'6", 250, caught 48 passes for 679 yards and 5 TDs last season. Jeff Holland, 6'4", 248, is another weapon at tight end. The Nittany Lions staff are also very high on sophomore wide receiver Juwan Johnson, who had a big spring and looks ready to break out. He is 6'4", 228, a big target who can run. Penn State did lose star Chris Godwin to the Tampa Bay Bucs; he was a third round pick. Godwin caught 59 passes for 982 yards and 11 TDs. But Johnson, along with DeAndre Thompkins, 5'11", 187, DeSean Hamilton, 6'1", 206, who caught 34 passes for 506 yards and a 7, along with Saeed Blacknall, 6'3", 217, Irvin Charles, 6'4", 217, and Brandon Poik, 5'9", 175, can all be very good playmakers in the passing game. McSorley has a lot of weapons to work with. Franklin brought in 3 pretty highly rated incoming freshmen receivers, so they could add to the talented group he'll put on the field this fall. The offensive line returns 6 of 7 players who started at some point last year including 4 starters. Connor McGovern will be the leader at center. He's a returning starter and stands at 6'5", 312. Left guard Ryan Bates, 6'4", 312, left tackle Brendan Mahon, 6'4", 318, and right tackle Andrew Nelson, 6'6", 305, are all returners for an offense that averaged 380 total yards and gave Barkley and McSorley plenty of space to work with. Right now, the starter at right guard is sophomore Steven Gonzales, 6'4", 341, and there looks to be pretty good depth overall up front. Not super depth, but some that can be developed. Franklin brought in 3 linemen, including high 4 star C.J. Thorpe, a 6'3", 318 pound guard, so he and the other 2 guys may be able to provide some more depth. Franklin is in his 4th year, and I always think it takes 5 years to really get your program in place unless you're Nick Saban or Urban Meyer. But Franklin looks to be in pretty good shape with the group he has on offense this season. Free safety Marcus Allen led the team in tackles last season with 110 and added 6 tackles for loss. That's not always a good sign when your safety leads your team in tackles- you want your linebackers to- but they return some other solid players on the defensive side of the ball. Middle linebacker Senior Jason Cabinda, 6'1", 234 is the leader of the defense. He registered 81 tackles last year, 4 for loss and a sack. He was one of the stars of their spring, and he is a really solid guy personally as I heard him in an interview and he was impressive. He will be quite a player this season. Defensive tackles Curtis Cothran, 6'5", 301, and Robert Windsor, 6'4", 303, are 2 cogs in the middle of the defensive front. Defensive end Shareef Miller, 6'5", 257, will be counted on to get to the quarterback and affect him this season. Penn State recorded 40 sacks last year and 10 ints, which are decent numbers, but as Coach Saban says, 'sacks don't win games, affecting the quarterback does.' I thought that was an interesting comment by S. The secondary looks pretty solid with Allen, 6'2", 207, and corner Grant Haley, 5'9", 190, leading that group. They will need to jell in time for the season opener which is just a week and a half away from starting. But there is good personnel to work with on the back end. Penn State opens with 3 out of conference home games. Akron and Terry Bowden come to Happy Valley on Saturday, Sept. 2nd, for an 11 AM CT kickoff on ABC. Then the Pitt Panthers are at Penn State on Sept.9th at 2:30 PM CT on ABC. Pitt defeated Penn State, 42-39 last year, so the Nittany Lions will be looking for some retribution. Georgia State on Sept. 16th is the third straight at home, then they hit the road where they are @ Iowa to face the Hawkeyes, a pretty good, under the radar team in the Big Ten. That should be a competitive game. Indiana comes to Happy Valley on Sept. 30th, then the Nittany LIons are @ Northwestern Oct. 7th. Northwestern defeated them soundly at Happy Valley 2 years ago. The teams didn't play last year. The Wildcats are a perennial bowl team and always field a solid team under Pat Fitzgerald.. Northwestern defeated Pittsburgh 31-24 last year in the Pinstripe Bowl in Yankee Stadium, and they have a good amount of players back. That'll be a challenge. After an off week on Oct. 14th, Penn State hosts Michigan, Oct. 21. Harbaugh has a young team, but he's recruited well, and the Wolverines embarrassed the Nittany Lions last year at the Big House, 49-10. It was the fourth game of the season and dropped Penn State to 2-2. They won their next 9 before losing in the Rose Bowl. If it wasn't interesting enough, the Nittany Lions then play @ Ohio State. Could be pivotal there in the Big Ten, though there are a ton of big time games before that one. That game will be televised by FOX at 2:30 PM CT on Oct. 28. On Nov. 4th, the Nittany Lions are @ a usually good Michigan State team. Though the Spartans had an off year last year, Mark Dantonio usually fields highly competitive teams, and this year's team will most likely bounce back. So another tough assignment. On Nov. 11th, Rutgers comes to Penn State. On Nov. 18th, Nebraska comes to Happy Valley, and on Nov. 25th, the Nittany Lions are @ Maryland. The Big Ten Championship game is Saturday, Dec. 2nd, at Lucas Oil Stadium in Indy, with a 7 PM CT kickoff. FOX will carry the game. So should be another riveting season in Happy Valley, and one that can possibly be elite. The pieces are in place for an excelllent year. Games with Ohio State and Michigan loom large, and they should be on alert for games @ Iowa, Northwestern and Michigan State. Nebraska at home is no picnic either. But it's a game at a time for every team nationally, and Penn State is no exception. I'm sure Franklin and his team have Akron squarely on their minds. Bowden took his 2015 team to an 8-5 record and a Idaho Potato Bowl victory over Utah State, 23-21. Last year they were 5-7, but they're competitive. Penn State will be a national contender this year if their defense can develop well in game 1 and going further. The offense looks locked and loaded for a big season. A lot of power names in this classic with Spieth, Johnson, McIlroy, Day, Matsuyama and Justin Thomas headlining amongst a star studded field. I'm going to take someone else though. I'll go with the 39 year old from Winter Park, Florida by way of the Ramblin Wreck. He played superbly at the 146th Open Championship 2 weeks ago going toe to toe with Spieth, but just got beaten by a masterful performance by the now 23 year old Texas phenom, who's looking pretty interesting heading into the 99th PGA Championship next week at Quail Hollow, N.C., a classic course. I'll take the man with the smooth swing, easy smile, and an All American personality. He finished T-3 here in 2016 shooting 66 on Sunday. DJ was the winner. Going with the Kuch to capture the championship at the Firestone South Course in Akron, Ohio. Saturday-Sunday, Golf Channel 11 AM-12:30 PM CT, CBS 1-5 PM CT. It's the year of the quarterback and the offense this season. There will be good defenses of course. Alabama and Auburn will be very good on defense, so will LSU, Florida, and Georgia has 10 defensive starters returning. South Carolina will be better. Vanderbilt will be pretty solid on defense. A&M should be better, but you never know with them. Their front 7 is always a question mark. Ole Miss will need to improve, same with State. Tennessee, who knows with them. I guess they'll be better. They've recruited well, but haven't seemed to develop a good defense. They have question marks overall on their team. Kentucky should be pretty decent on defense. Stoops is doing a good job in Lexington. Arkansas, like A&M, needs to improve on defense to be a competitor in the west. But overall, fairly solid defensive play this season. Defense is key a lot of times, but these quarterbacks will be electric this season. 1. Alabama-Jalen Hurts, primed for a big year. Tua Tagovailoa will play a role and has unlimited talent. 2.Auburn-Looking for a big year out of Jarrett Stidham, and they like their depth with Sean White, who will be competing for the starting job in fall camp, and freshman Malik Willis has a ton of ability. 3.Georgia-Jacob Eason should have an excellent year. 4.Ole Miss-Shea Patterson has off the charts talent. 5. Arkansas- Austin Allen is outstanding and very tough. 6. Mississippi State-Nick Fitzgerald is a phenomenal runner and passer. Needs to develop his downfield passing a little more. 7.South Carolina-Jake Bentley. The sophomore from Opelika, AL. is an outstanding passer and can move. 8. Kentucky-Stephen Johnson is another Fitzgerald-like player who passes it and runs it well. 9. Vanderbilt-Kyle Shurmur-Another excellent passer. Not too mobile, but with protection he can really pick apart a secondary. 10. Missouri-Drew Lock-Has a chance for a really big 2017. Outstanding arm, moves pretty well when necessary, but more of a pocket passer. Like him a lot. Should have a big junior year. Teams that need to find a good quarterback. All 4 of these teams have options, but need to develop a leader of their offense. 11. Florida- Has 4 players competing. Malik Zaire transferred from Notre Dame, and he has got a lot of running talent and some passing talent, but he'll be battling it out with 3 others including Luke Del Rio, who I personally like a lot. 12. A&M- Jake Hubenak is back, and he may be good enough, but there is a competition going into fall camp. 13. LSU- Danny Etling is back. Not sure he's the answer to making LSU a contender for the conference title. And there will be a competition come fall camp. 14. Tennessee- Two guys competing for the job right now. Undecided who the guy will be. One guy is Dormady. Jones likes both, so one of them will need to take the bull by the horns this August if Tennessee expects to challenge for the East crown. West-Alabama, but Auburn will really challenge the Crimson Tide. East-Georgia, but Florida will put up a big time fight with the Dawgs. Alabama 38, Georgia 34-Bama captures another SEC title under Nick Saban and heads to its fourth straight playoff. Will have breakdowns of all SEC teams along with other national contenders in Penn State, Ohio State, Michigan, Oklahoma, Texas, and Florida State coming up in the next 3 weeks. Thanks. Gus Malzahn is excited, pretty much ecstatic, about his 2017 Auburn football team. There are a lot of outstanding players and a great deal of quality depth. He likens this group to the 2013 team that made it to the national championship game, where they fell just barely to the FSU Seminoles in an exceptional game. Gus says, "this team is hungry. They have a chip on their shoulders from how last year ended and they have a lot they want to prove." I could see that happening in major ways, SEC title, the college football playoff. This team has the makeup. They'll have to get by the Alabama Crimson Tide at home, but everybody has to go through Alabama to win the SEC. That's the way it is in this conference. Gus knows that as well as anybody. Should be an epic Iron Bowl in Auburn, Saturday, November 25th. The big news was the transfer of quarterback Jarrett Stidham, the former Baylor standout as a freshman at Waco. Stidham didn't disappoint in the spring game as he had a gigantic day and showed signs of becoming a championship quarterback. But there is competition. Sean White is back and he threw for over 1,300 yards and was having a solid season until a shoulder injury hampered him severely towards the latter half of the season. AU was doing very well reeling off 6 victories in a row in 2016 before injuries to key players took its toll. But White is back and talented freshman Malik Willis provides Gus and first year offensive coordinator Chip Lindsey with 3 very good players under center. It starts there. Offensive line is tremendously deep, led by All American candidate, right tackle Braden Smith. Braden is a tremendously tough, physical player, and, along with center Austin Golson, will be a leader up front on a deep, physical group. They will pave the way for the dynamic running back tandem of Kameron Pettway and Kerryon Johnson. Pettway ran for over 1,300 yards last year and he and Kerryon accounted for 2,300 rushing yards for the Tigers. Pettway is down to 238 pounds from around 250, Johnson is up to 218 pounds. They will form a formidable duo for the Tigers on the ground. Gus likes the way Kerryon can catch the ball out of the backfield and make plays. Kam is developing in that area as well. Third string running back could be Malik Miller, a talented runner from Madison Academy, where Kerryon played. Gus likes Malik a lot, but says there is a battle going on for the 3rd string running back spot. At wide out, Nate Craig-Myers looked super in the spring. Craig-Myers accounted for 4 or 5 major explosive plays (over 30 yard catches-runs) for the Tigers in the spring game. He has arrived as a special, game changing player for the Tigers. Darius Slayton, Kyle Davis and quite a few others will be threats in the vertical game. Gus brought up John Franklin III and what a weapon he can be in the passing game and the return game. Gus calls him "the fastest guy I've seen in pads in a long time." Jalen Harris looks like the starting tight end at this point. Tight end will need to be developed in fall camp. Offense looks outstanding. Stidham appears to be the most talented QB, but White is ready to battle it out with him in August. Willis looks like a stellar quarterback who will very much be in Auburn's future plans. The defense returns as the 7th best scoring defense in the country. Auburn only allowed 19 points per game last year. Kevin Steele, in his first year, had the Tigers playing exceptional defense. Gus calls linebackers Deshaun Davis and Tre' Williams, "the quarterbacks of the defense." He is really high on both players. He likes the depth there too. Up front, Marlon Davidson will be a handful for offensive linemen and is a potentially dominant defensive end helping fill the holes left by the departures of Carl Lawson and Montravius Adams, who were both drafted by the NFL. Dontavious Russell is an underrated defensive tackle. He's excellent. Derrick Brown was a highly acclaimed 5 star 2 years ago and he's a 300 pounder who can be a major disrupter in the middle. A guy Gus and Steele are looking for to take the next step to becoming an elite football player is defensive end Byron Cowart. Cowart was a highly acclaimed 5 star 3 years ago with so much promise. If he can step his game up and become an elite player, that will also boost the front 7. The secondary will be led by safety Tray Matthews and cornerback Carlton Davis, both excellent players. Stephen Roberts is another who will be a major impact player at safety. Javaris Davis is listed as the other starting corner, so that will be determined how that other corner spot develops opposite Carlton Davis. The kicking game is led by the sensational Daniel Carlson, who I would say is the best kicker in college football. Carlson is amazingly accurate and can hit from major distance, 50-55 yarders for sure, probably deeper if necessary. He's quite a weapon. Punters are Carlson and Ian Shannon. Franklin III could very well be an explosive player as a punt returner, with Ryan Davis getting a shot too. Kerryon will be one of the kick returners. Craig-Myers could get involved in that too. As talented as the Tigers are, once again they have a very difficult schedule. They go to Clemson in week 2 after opening up with Georgia Southern on Saturday, Sept. 2. A pretty pivotal game early in the season in Clemson's Death Valley, but Clemson's quarterback situation is not settled, so I see AU with an advantage there. But the Tigers can't sleep on the Georgia Southern Eagles and their triple option offense. Those offenses always gives defensive coordinators nightmares and causes problems for the defense. So AU will have to be ready to play on Sept. 2nd. Mercer is next Sept. 16th. In the SEC, AU is @ Missouri on Sept. 23rd, home vs Ms, State, Sept.30th, home vs Ole Miss, Oct.7th, then have a tough stretch of road games, @ LSU, Oct. 14th, @ Arkansas, Oct. 21st, an open date, @ A&M, Nov. 4th. Then they come home for the South's oldest football rivalry and one of the most physical, toughest games of the year against the Georgia Bulldogs on Nov. 11th. That should be a classic. The Tigers host Mercer after that Nov. 18th, then the Crimson Tide comes into Jordan-Hare Nov. 25th, a Saturday. The schedule is tough, but they all are in the SEC. The SEC will have superb quarterback play this year, so a good quarterback/offense will be critical. You have to play defense in the league too, and Auburn looks like they'll be able to do that along with running the football, two key areas to winning SEC games. If the Tigers can stay mostly healthy, and Stidham, if he's the starter, can play on an elite level, like he did in the spring, this will be an elite football team capable of challenging the Crimson Tide for the SEC West title and a chance to get into the college football playoff. I'm a buyer in the Auburn Tigers. Gus has a special group that can do some spectacular things. 10-11 victories is highly possible and a trip to Atlanta and beyond that is entirely attainable for this 2017 Auburn Tigers football team. Weather: 75-80 throughout the weekend. Tomorrow, perfect, sunny 75, wind 10-18 MPH. Chances of t-storms over the weekend, winds anywhere from 7-17 MPH. TV: Thursday-Friday, Golf Channel, 1:30-5:30 PM CT/2:30-6:30 PM ET; Saturday, GC, 11:30 AM-1:30 PM CT/ 12:30-2:30 PM ET; CBS, 2-5 PM CT/3-6 PM ET; Sunday, GC, 11 AM-1 PM CT/12-2 PM ET, CBS, 1:30-5 PM CT/2:30-6 PM ET. Notes, Don Wallace, the senior director of Shotlink on the PGA Tour, which is an amazing service that gives the networks the ability to show the viewer the actual distance of drives and a players exact position on the green with his exact proximity to the hole, meaning Jordan Spieth is on a green and Shotlink shows the viewers he has 31'1" to the hole. It's great stuff. Wallace said the old axiom, "Drive for show, putt for dough," is not accurate. He says it's more like "drive for dough," as the stats show players positioned well in the fairways, fare better in tournaments than players who putt well. I think it's both. To me, driving accuracy, distance and strokes gained putting are equally the top stats in golf. But really, you have to have it all. Greens in regulation are very important, proximity to the hole, the closer you are to the hole the better chance you have or making birdie, and scrambling are critical also. It depends on the course. At the U.S. Open, which comes up in 2 weeks at Erin Hills in Wisconsin, I would say scrambling is key as are strokes gained putting. Driving accuracy is always important. A U.S. Open is more about surviving, so saving pars is critical. Getting up and down is a major part of winning a U.S. Open. When Martin Kaymer won at the Open at Pinehurst in 2014, his "Texas wedge," his putter from off the green, was superb. Dustin, last year at Oakmont, was putting superbly, but everything was clicking. His distance is always tremendous, and like Jay Bilas, ESPN expert basketball commentator, says, "Don't let anyone kid you, size matters," and I believe that axiom applies to football that "recruiting rankings matter." Alabama's done OK with No.1 recruiting classes I'd say. So does distance in golf. Accuracy is critical as well. So with all that it's about putting it all together. I like the driving and putting stats the best, but greens in regulation, proximity to the hole, scrambling all matter in winning golf tournaments, especially majors. Can't wait for the one coming up. Always sensational at the United States Open, with many heavyweights competing for that coveted major. An uphill tee shot with room in the fairway can cause problems if you over-cut it with sand to the right, a tough sand trap with a large lip on the end of it that players will have to clear on their second shot. If a player over-cooks it, he could be in the creek on the left or blocked by the trees for his second shot, so driving accuracy, with the pressure of the 72nd hole and a championship within grasp, will be a challenge off the tee. The second shot has to clear the bunker in front and needs to try and stay clear of the bunkers guarding the entire green. Long is a tough up and down from behind the green. The great one, Jack, will be waiting for the winner who can navigate this hole the best. Toughest hole on the course, and one of the more famous ones in golf. I'm going with the 23 year old to get back into the winner's circle and shake Jack's hand on 18. He shot 65 in the final round of the Dean and Deluca last week at Fort Worth, and his greens in regulation percentage is tied for number one on the tour. He putted very well last week. His driver can be an issue at times, with accuracy causing him problems, but I like this stellar player and person to take home the trophy and be ready for Erin Hills in two weeks. Can Dabo Sweeney and his Clemson Tigers repeat the magic from 2016 and make it to another playoff and go back to back? That depends on his quarterback play. Clemson lost one of the greatest college quarterbacks in the history of the game as the superb Deshaun Watson finished off his illustrious career with a national championship on a last second TD pass to Hunter Renfrow to capture the coveted prize. Deshaun is now with the Houston Texans in hopes of leading talented Texans to greater heights and a Vince Lombardi Trophy in the future. More than one for that matter. Deshaun was exceptional and an amazing success story. As for the 2017 team, the Tigers have material all over the field, but in order to make the playoff and win it all, they need to develop a quarterback who can successfully run the offense, make plays consistently and take care of the football. There are 4 candidates. Kelly Bryant, a 6'3", 215 pound junior, got the start in the spring game. Bryant can really create plays with his legs, but needs to sharpen up his passing. He needs to be more consistent with all his throws and become a better downfield passer. Zerrick Cooper, a 6'2", 205 pound redshirt freshman, is another exceptional runner who showed some promise in the spring game with his arm, but needs some polish passing the ball as well. Tucker Israel is a 5'10", 180 pound sophomore who is on the smaller size, but has a pretty good arm. And then there is 99, 5 star freshman Hunter Johnson, 6'4", 200 pounder (ranking by 247 sports), who has a super arm, pretty good mobility and a chance to be special. But Johnson needs some work in all phases of playing the position. So Sweeney and his co-offensive coordinators, Jeff Scott and Tony Elliott, have a lot of work ahead of them to get these guys ready for Clemson's September 2nd opener against Kent State at Death Valley. But there's no doubt they'll put in the work and so will their players. If they can develop these guys and get a bona fide starter and backup the talent around the signal caller and on the defensive side of the ball are off the charts good. The offensive line will be led by left tackle Mitch Hyatt (6'5", 295), who isn't massive, but a powerful, physical player and a leader. Left guard Taylor Hearn (6'5", 325) gives the left side an impressive, potentially dominating combination. The line returns 4 of 5 starters and there is quality depth behind them as Dabo's recruiting has been sensational. Running back will be manned by three talented players. Returnees C.J. Fuller (5'10", 215 Jr), Adam Choice (5'9", 210) and Tavien Foster (5'11", 210) are three backs Dabo thinks can all play on Sundays. Running back is stellar and 2017, 92, 4 star Travis Etienne (5'11", 210) is coming in for fall camp. Wide receiver is excellent with junior Deon Cain (6'1", 210), who pulled in 38 passes for 724 yards and 9 TDs, leading the charges. Ray Ray McCloud is a playmaker out wide as well. McCloud, a 5'10", 180 pound junior caught 49 passes for 472 yards and 2 TDs. He's explosive, a playmaker, like Cain. And the awesome Renfrow, the 5'11", 180 pound redshirt junior, who caught 44 passes for 495 yards and 6 TDs and was a key part of the national championship victory and also the year before in that amazing game with the Crimson Tide, is back and will be a key target. So whoever the quarterback is, he will have a super arsenal to work with. Stellar tight end Jordan Leggett is gone to the NFL, so the Tigers will need to replace him too. Juniors Garrett Williams (6'3", 245) and Cannon Smith (6'5", 265) will compete for that spot. On defense, the front for stellar defensive coordinator Brent Venables will be dominant again. Clemson is becoming known as d line U along with Bama and Auburn is starting to make its case for that moniker as well. Junior defensive end Christian Wilkins (6'4", 310), sophomore defensive tackle Dexter Lawrence and sophomore defensive end Clelin Ferrell (6'5", 265) are all 3 potential All Americans. They are dominating players with tremendous size, toughness and physciality. They can blow up the running game and get to the quarterback. All 3 are superb. There is excellent depth on the d line as well. Linebacker looks terrific with redshirt freshman Shaq Smith (6'2", 240), junior J.D. Davis (6'2",225) and depth. The secondary may be the biggest strength on this team. Corners, junior Mark Fields (5'10", 180) and senior Ryan Carter (5'9", 180), are experienced players who are tremendous in coverage and can make game changing interceptions. Sophomore strong safety Denzel Johnson (6'0", 195) and junior free safety Van Smith (5'11", 195) are stellar also. Depth is good in the secondary and all over the defense. Kicking game looks solid with Greg Huegel and Alex Spence handling the kicking and punting duties respectively. McCloud returns punts, and can take it to the house every time he touches the ball. Fuller and Feaster are explosive in the kick return game. This is a really good football team, but a team that has to develop a quarterback if they want to be exceptional, make the playoff and advance in that. The key games, even though they're all key in college football, are Auburn, Saturday, Sept. 9th @ home, Sept 16th @ Louisville, Sept. 30th @ Virginia Tech, Oct. 28th, November 4th @ NC State, @ home vs Georgia Tech, Nov,. 11, @ home vs Florida State in what could be a colossal game in the 2017 season nationally, and @ South Carolina, Saturday, Nov. 25th. Will Muschamp will have a much improved team and South Carolina is ready to extract some revenge against Clemson after losing to the Tigers the last three years, including a 56-7 drubbing last season @ Death Valley. The Palmetto Bowl should be compelling. This is an extremely talented football team. Double digit victories are certainly attainable and a chance to make the playoff a possibility. But I see some issues at quarterback preventing Clemson from making the semifinals. They should have a good team, 10 wins and a New Year's Six Bowl in the Orange or the Peach Bowl, the semifinal playoff games are at the Rose and Sugar Bowls respectively Jan.1, 2018, but I don't see them making the playoff this season. Still, the team should have another outstanding year, and with Johnson maturing under center and with 2018 .9998 5 star Trevor Lawrence (6'6", 196), Clemson will certainly be ready for the playoff in 2018. Two thousand seventeen is not totally out of the question. They have a couple of tough road games @ Louisville and @ Virginia Tech. Winning those 2 would be tremendous. Auburn @ home will be extremely challenging as the Auburn Tigers have found a talented signal caller in Jarrett Stidham, to go along with exceptional talent around him. FSU is a superb looking team. South Carolina on the road to finish off the season will be challenging. I like 9 to 10 wins, depending on quarterback play and injuries. This program is spectacular and may find a way to make the playoff, but the quarterback issue is the factor that will keep them out this season. Still, Dabo Sweeney will field another very good football team at Clemson. I've been correct on the last 3 winners of the Derby, California Chrome in 2014, Triple Crown winner American Pharoah in 2015 (what a horse, first since Affirmed in 1978 to win the Triple Crown), and Nyquist last year. Haven't had as much success with the last 3 Preakness and Belmont predictions, but this year is a new year, so charged up for this year's Triple Crown season. Feel good about the favorite in this one. The 3 year old's trainer, Todd Pletcher, is an experienced hand who won the Derby in 2010 with Super Saver. The 50 year old Pletcher has 4,000+ victories and counting. Jockey John Velazquez, 45, won the Derby aboard Animal Kingdom in 2011. Velazquez, born in Carolina, Puerto Rico, has approximately 5,590 victories on his resume. Both Pletcher and Velazquez have 2 Belmont victories as well. Like this dynamic duo and I really like this horse, which is extremely impressive looking. Like the horse's genealogy, too, as his sire is Bodemister which won the 2012 Arkansas Derby and was runner-up at the 2012 Derby and Preakness respectively. This colt won the Florida Derby at 1 1/8 miles in on April 1st, won on Gulfstream Park in Florida on March 4th (1 1/8 miles), and also at Tampa Bay Downs (1 mile, 40 yards). He's 3 for 3 this year, all on dirt tracks, which is the surface at Churchill Downs. This 3 year old is a good looking, powerful horse with massively built legs. Churchill Downs got a ton of rain yesterday, but the forecast is for sunny skies beginning at noon today, and the track dries well at Churchill Downs, so expecting a fast track by post time. Irish War Cry and Classic Empire will challenge, but I'm going with the 5:1 colt to be victorious in "the Most Exciting 2 minutes in sports," capturing the 143rd Kentucky Derby. Like the team of Pletcher (above, photo courtesy of Daily Racing Form) and Velazquez (middle, photo courtesy of the Kentucky Derby 2017) to emerge victorious on their terrifically built and super looking horse, Always Dreaming (bottom, photo courtesy of Daily Racing Form). The Auburn Tigers have found their quarterback. Sean White had a decent year last year, and is serviceable, but Jarrett Stidham, the sophomore Baylor transfer, is dynamic, explosive and extremely accurate with the football and has with underrated, excellent mobility. Stidham is what you are looking for in a prototypical quarterback, college or NFL. Auburn can win a lot of games with Jarrett Stidham under center with all the talent he has around him in the backfield, some emerging weapons on the perimeter, and an excellent offensive line led by senior right tackle Braden Smith (6'6", 305) and center Austin Golson ( 6'5", 314). Stidham, 6'2", 210, completed 16 of 20 passes for 267 yards, and despite not throwing a TD, he made some hugely explosive plays in the passing game with stud sophomore wide receiver Nate Craig-Myers, some nice intermediate throw, catch and run plays with Will Hastings, some explosive plays with Darius Slayton and a couple of nice throws to Ryan Davis. All four of those receivers looked excellent. Junior tight end Jalen Harris showed some good talent with a couple of nice catch and runs in the game played before 46,331 fans at Jordan-Hare Stadium. Craig-Myers, a 98, 4 star in the 2016 class, who was one of the top rated wide receivers in the nation in the 2016 rankings, caught 5 passes for 154 yards including a couple of deep ones, one a 50 yarder. He's a dynamic, take it to the house weapon for the Tigers in the aerial game. Nate is 6'2", 208. Hastings looks like a Wes Welker type player and is a highly effective target for Stidham or Sean White, though I'm leaning heavily towards Stidham and actually think true freshman Malik Willis, 6'1", 185, is a stud and can supplant White as Stidham's backup. Willis has a great future if he'll stick it out because he's quite a quarterback. White is going to have a hard time finding the field next year unless he turns it up major league in August. Hastings caught 7 passes for 75 yards. He's awesome. He's not big in stature at 5'10", 175, but he's a playmaker and a winning football player. Slayton also caught some big balls from Stidham. Darius caught 3 passes for 65 yards, including a 46 yarder. Ryan Davis caught 2 passes for 41 yards and Marquis McClain made a huge catch and run on a 69 yard reception he caught over the middle from freshman Devin Adams that he hauled in at the 45 and took to the house outrunning everybody on the defense. Slayton is another taller receiver at 6'2", 191, Davis, who caught 25 passes for 194 yards and a TD last year, is 5'9", 175, but is highly effective as a receiver. He can get open and has excellent hands and speed. Eli Stove didn't play in the spring game, but he is pretty stellar as well. The rising sophomore caught 23 passes for 224 yards last year and ran for 134 yards and a 7 before getting hurt. Auburn had issues with injuries last year, particularly on offense. While some might say Stidham's performance was in a spring game and not as significant, I disagree. It matters. Any time you play in a live situation and perform like Stidham did, it's impressive. He's a big time college quarterback this season. Auburn is in good hands under center. Malik Willis is some kind of player, too, so if Stidham happened to go down, Gus and offensive coordinator Chip Lindsey wouldn't hesitate to put Willis in. He's going to be a big time player. I know Sean White is still in the mix, but those two really stood out to me. Another thing on Stidham, he has terrific playing experience from 2 years ago as a true freshman at Baylor. In the games he played, he completed 75 of 109 passes, 69%, for 12 TDs against only 2 INT's. In his three starts, he was 23-of-33 for 419 yards, 3 TDs and 0 INT's against Kansas State, a 31-24 Baylor victory, was 16-of-27 for 257 yards, 2 TDs and 2 INTs in a 44-34 loss to Oklahoma. That was against an OU team that made the playoff in 2015 before losing to Clemson handily in the semifinal at the Rose Bowl. Against Oklahoma State, in the game he got hurt in, Stidham was 12-of-21 for 258 yards in a 45-35 Baylor victory. That was an unbelievable year for Baylor. They were working on their 4th quarterback by the time they got to the Russell Athletic bowl vs North Carolina, and had aspirations of making the playoff until a slew of injuries really hurt them, but still found a way to pummel Gene Chizik and the North Carolina defense, 49-38. So Stidham's resume is pretty spectacular looking. You throw in a good stable of running backs along with an outstanding looking offensive line, and you've got a potent offense. 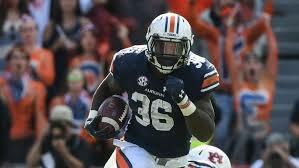 Kamryn Pettway didn't play in the spring, but Gus and Lindsey know they have a great one there. Kam ran for 1,224 yards and 7 TDs in 2016, and battled some ankle injuries like it seemed like most of the skilled player on the Auburn offense did, particularly at running back. But Kam is special. So is Kerryon Johnson. Kerryon ran for 895 yards and 11 TDs last year, and was having a super spring game until he got tackled by the ankles and suffered a high ankle sprain in the game. He had already run for 47 yards and looked excellent. He'll be ready come August. That's an excellent 1-2 tandem for the Tigers at running back. I really like Malik Miller as a runner. He showed some signs last year that he'd be a good player. Miller comes from the same high school in Huntsville, Madison High, that Kerryon played at, and I really like him.. He had some good runs in the spring game. At 5'11", 235, he's a load who can run between the tackles and also possesses excellent speed that can create explosive plays. Kam Martin, who also got hurt last year, is another one to watch. Kam Pettway is 6'0", 237 and Kerryon is 6'0", 204. Kam Pettway and Kerryon are juniors. Malik is a sophomore. I was also pretty impressed with junior C.J. Tolbert out of the backfield. Horton is small in height at 5'7", but he's a tough 187 pounder who likes to mix it up. He's good. So the offense looks set. On defense, 8 starters return, so this group should be good to go. They were good last year. Kevin Steele told Brock Huard of ESPN that he wants "30 starters," meaning he wants at least 30 guys who he can count on defensively. With defensive end Marlon Davidson (6'3", 282), and Derrick Brown 6'5", 316) at defensive tackle, Auburn has some stars up front. Byron Cowart needs to realize his massive potential. The 6'3", 283 defensive end was a 5 star, top 10 player, in 2015, so he needs to live up to it. I've heard he's showing signs of it. Tre' Williams (6'2', 225 SR) and Deshaun Davis (5'11", 246, JR) are the leaders and the playmakers on the second level for the Tigers at linebacker. Really like both of those guys. Tray Matthews (6'1", 209, SR) is a leader and a ball hawk at strong safety, and the awesome Carlton Davis (6'1", 203, JR) returns at corner. There is good talent and depth in the secondary. Daniel Carlson is back to kick and he looks ready for an All-American season this year as he kicked 5-of-5 field goals in the spring game. He connected from 55 yards on one of his kicks and he also connected on a 60 yarder with what looked like 5 or 6 yards to spare at the end of practice with a little bit of pressure. He's superb. Punting duties could go to Ian Shannon, but with Shannon out on a family engagement during the spring game, Carlson punted and averaged close to 42 yards. He can do it all. Kerryon can return kicks, maybe Malik Miller, and Stephen Roberts and Ryan Davis are listed as the punt returners. Those are pretty explosive players. Kam Martin could also return kickoffs with his sub 4.4 speed. The Tigers open with Georgia Southern at home on Saturday, Sept. 2. Georgia Southern won the 2015 GoDaddy Bowl and finished 9-4. They slipped to 5-7 last year. They run the triple option which causes defenses problems. So Auburn will have to be prepared for that trickeration offense. Week 2 is at Death Valley and the Clemson Tigers in a huge contest, Saturday, Sept. 9th. Wow, what a classic that should be. Will have write up on Clemson early next week along with Florida State. Dabo's cupboard is always loaded now, but they're breaking in a new quarterback, so there's inexperience there. Auburn definitely has a shot at Clemson. Mercer Sept. 16 at home, @ Missouri, Sept. 23rd, not easy, home versus Mississippi State, Sept. 30, home versus Ole Miss, Oct. 7, @LSU, Oct. 14, @Arkansas, Oct. 21, off, @A&M Nov. 4, @home vs Georgia Nov. 11, La Monroe at home, Nov. 18, then the Alabama Crimson Tide on Saturday, Nov. 25th in what could really be an epic for both SEC and national purposes. I really like this Auburn Tigers football team. Stidham is the real deal, there are playmakers all over the field, the offensive line is deep, big and physical, the defense looks loaded and can get turnovers, sacks, tackles for loss, all of that. There's good size and athletic ability up front, good size and athletic ability at linebacker and super physical players with ball hawking skills in the secondary. Daniel Carlson is an all world kicker. I can see a run at an SEC championship for this football team. @ Clemson in week 2, though the Tigers don't need to look past game 1, is a big game. The games at home against the Mississippi schools are big. Both State and Ole Miss have good quarterbacks in the dynamic Nick Fitzgerald for State and Shea Patterson for Ole Miss. Then @ LSU and @ Arkansas in October, and, after a bye week, @ A&M Nov. 4th are huge season changing games. Georgia at home the next week in the Deep South's oldest rivalry will be a massive challenge for the Tigers facing Nick Chubb, Sony Michel and quarterback Jacob Eason who are all three trying to put Georgia back on the radar in the SEC and in the national landscape. Georgia will be much improved and challenging for the SEC title. Then, of course, the Iron Bowl, which could be a majorly important one along with all the importance of the game to begin with. So, like all SEC teams, the Tigers have their work cut out for them to play in a major postseason game or games. But an SEC Championship and a playoff spot is certainly attainable with good health, because the talent is certainly there. I don't like to put a number on victories for a team because to me that limits them. Auburn definitely looks like a double digit victory team. Like everybody else, key players need to stay healthy. But if that happens, this team has a shot for a tremendous 2017 season. Montravius Adams 3rd round to the Packers; Carl Lawson, 4th round to the Cincinnati Bengals; Rudy Ford, 6th round to the Arizona Cardinals; Josh Holsey, 7th round to the Redskins. Kisner almost won last week in a two man team event with Scott Brown at the Zurich Classic. Kisner and Brown lost in a playoff to Euros Jonas Blixt and Cameron Smith. I like the 33 year old from Aiken, South Carolina to get the job done this week at Eagle Point Golf Club (7,259 yards, par 72) in Wilmington, N.C.
Quail Hollow Club in Charlotte, which usually hosts this event, will be hosting a very important event in August, the 99th PGA Championship, so Eagle Point gets this tournament. Jimmy Walker won the PGA Championship last year at Baltusrol Golf Club. Interesting course in Wilmington though. Should be a compelling Sunday. Will have a thorough golf column next week as the Players Championship commences next Thursday. The tour's fifth major, as the Tour players have labeled it, is a goal for all the big names on tour every year. Should be riveting at TPC Sawgrass next week. The Blazers out of spring football look pretty darn good. I'll take a look at Bill Clark's squad, a team the city should be excited about. The players head to the Crescent City this week for the Zurich Classic. This year's competition is a two-man team comp with alternate shot on Thursday and Saturday and best ball on Friday and Sunday. TPC Louisiana is a 7,425 yard, par 72 layout. This is the first time the Tour has hosted a team competition since 1981 at the Walt Disney World Team Championship. Some of the key teams are Justin Rose-Henrik Stenson, the gold and silver medalists winners respectively at the Rio Games last summer. Justin is also the 2015 champion here. Jason Day and Rickie Fowler form another formidable team. Jordan-Spieth and Ryan Palmer team up. Other key teams are Louis Oosthuizen-Branden Grace and Bubba Watson and J.B. Holmes, Brooks Koepka, who finished 2nd to Kevin Chappell last week at the Valero, shooting a 65 on Sunday, is teamed up with his brother Chase, who plays on the European Challenge Tour like Brooks did before making it on tour. A local Alabama group features former Crimson Tide players Trey Mullinax and Bobby Wyatt, members of national championship teams at the University in 2013 and 2014. Spike and Walter had a superb pick in Kevin Chappell, who was victorious at the Valero Texas Open with a final round 68, and birdied 18 to capture the victory @ -12. Spike and Walter liked the way he was trending and they were correct. Walter now has 3 W's on the season and Spike is on the board. Brownie had Jimmy Walker. Walker finished -5 and tied for 13th. I picked Ryan Palmer, and he was one shot back going into Sunday and looking good, but he struggled on the front, but got it together on the back with birdies on 14, 15, and 16, but was too far back and finished -7, T-6th. Still OK with the pick. Weather: Thursday, Sunny, 83, perfect, wind 8-10 MPH; Friday, Cloudy and breezy, 20% t-storms, wind 14-22 MPH; Saturday, 87, partly sunny, 60% T-storms in spots, wind 17-24; Sunday: 81, chance of strong t-storms, 95% chance, wind 18-28 MPH. TV: Thursday-Friday: Golf Channel: 2:30-5:30 PM CT/ 3:30-6;30 PM ET. Saturday-Sunday: Golf Channel, 12-1:30 PM CT/1-2:30 PM ET, CBS: 2-5 PM CT/3-6 PM ET. Key holes, No.15 is a 490 yard par 4 that has trees and a long bunker on the left along with trees and a waste area on the right that makes the tee shot challenging. The green doesn't have any bunkers, but runs away from the players and has slopes that make any pitches or chips difficult. Par is a great score on 15. No.17 is a 215 yard par 3 that features a pond that runs down the entire left side of the hole, so too much of a draw or an overcook puts the competitor in the water. There are bunkers on the right and the green is narrow. Par is another solid score on this hole. No. 18 is a 585 yard par 5, dogleg right. There is sand along most of the left side and water in play on the right. Pete Dye extended the water out from the right so the second shot, if the player is going for the green, is a high risk-reward with the pressure packed Sunday afternoon. There is sand in front along with mounds. So challenging finishing hole for the tandems Sunday. Sunday looks questionable weather-wise and Saturday doesn't look great. Hopefully the teams can get in 72 holes. Wind will play major factor this weekend, starting Friday. Going with the favorites here. They are 4-2 as a Ryder Cup pairing. They are both major winners, one at the U.S. Open in 2013, and the other at the Open Championship last year (2016). Going to ride these horses. Like Brooks (above, photo courtesy of PGA.com) and little brother Chase (photo courtesy of Golfweek ) to challenge and possibly pull it off this week. This is a classic showdown between the top seed in the West and the top seed in the South with prolific players and excellent coaches all over the court. I was a litte hard on Roy Williams on Saturday, but he's won 2 national championships at Carolina, in 2005 and 2009, so that speaks for itself. Mark Few is outstanding, too. Classic matchups of players and coaches. Gonzaga features the awesome Nigel Williams-Goss at guard, 6'3", 195, who poured in 23 against South Carolina on Saturday in a 77-73 Zags victory and averaged 17 points and 6 boards this season, along with almost 5 assists. He's a spectacular player. Jordan Mathews is a superior marksman. He sank 4-for-8 from 3 on Saturday and sank close to 40% of his 3's this season. When he gets it going, he's a sharpshooter from trifecta. I know that 7'1", 300 pound Przemek Karnowski gets a lot of the credit, as he averaged 12.3 ppg and 6 rebounds this season and had 13 big points and 5 rebounds on Saturday, but I like 7'0", 230 pound freshman Zach Collins better. Collins played 23 minutes Saturday coming off the bench and scored 14 points and yanked down 13 boards. He's their best guy inside. Karnowski is good, but Collins really makes them go underneath. This is an excellent basketball team with one of the top 5 coaches in the country at the helm. I'd put Mark Few in the top 4 with Roy, Cal and Pitino . He's a difference maker. UNC counters with the best player in the country in Justin Jackson. The 6'8", 210 pound junior didn't win the Naismith Award this season given to the top player in the country, Frank Mason III of Kansas won it. But Jackson was more deserving. He is the key cog, along with Kennedy Meeks, that makes this Tar Heels team go. Jackson averaged 18 points and 5 boards this season, and was sensational Saturday against Oregon in a 77-76 UNC semifinal victory, finishing with 22 huge points. He's superbly clutch. Jackson was 4-for-9 from the field and 6-for-6 from the free throw line playing 38 of the 40 minutes. He's almost a flawless player in my opinion. So smooth. Just a highly skilled, outstanding player. Six-foot-10 inch, 260 pound Kennedy Meeks was just as terrific Saturday Night. In 30 minutes, Meeks scored 25 points on 11-of-13 from the field and grabbed 14 boards. Wow. He's also a superb young guy. He was very humble and gracious after the game and respectful of Oregon. Really like Kennedy. Justin is a super guy also. Point guard Joel Berry II has been battling ankle issues, but is playing through it with courage, and giving it max effort. The junior point guard averaged 14 points and 4 assists this season and posted 11 points Saturday battling against a tough opponent in Oregon for 35 minutes, and just his presence for UNC makes the team better. He's a stud. Isiaiah Hicks, 6'9", 242 pounder, battled some injuries Saturday, and wasn't his true self, but he's another stellar frontline player for the Tar Heels. I expect Luke Maye, the super 6'8", 235 pound 6th man for the Tar Heels to have a good game tonight. He wasn't as big a factor Saturday, but he is a spark plug for this team off the bench. Six-foot-six, 211 pound junior Theo Pinson is excellent. He had 8 points and 8 boards on Saturday. So is 6'1", guard Nate Britt. I'm very bullish on both of these teams. UNC has massive talent and they were in the championship game last year and lost on a last second 3 pointer by Kris Jenkins of Villanova in the national championship game. Most of those players are back as this is an upperclass team. The Tar Heels still played superbly in that game. It was an extremely high level game. The score was 77-74. Gonzaga is outstanding as well, and is confident and has a superb coach on its bench. But so does North Carolina in Roy Williams. Justin Jackson, Kennedy Meeks andJoel Berry II are all 3 stellar, and UNC has unfinished business from last year.. This is going to be another epic like last year, but I expect the Tar Heels to win their 6th national championship in their storied history, and 3rd in 13 years under 15 year coach Roy Williams. The Final Four features two stellar defensive teams in the first game and two more offensively inclined teams in the second though one of those teams in the second game plays some good defense as well. Gonzaga vs. South Carolina in game one and Oregon vs North Carolina in game 2 at the University of Phoenix Stadium. Here's a look at the matchups along with forecasts for who wins. Gonzaga allows 60.9 ppg and is the best team in the country at allowing the least points per 100 possessions per game. South Carolina is 2nd best in the country in that category. Both teams are tough mentally and physically, good offensively when they need to be, and relentless. Love the coaching matchup with the cerebral yet intense Mark Few versus the highly intelligent and ultra intense Frank Martin. Super coaching duel. Gonzaga has awesome guard Nigel Williams-Goss, who is a solid outside 3 point shooter, and can drive and score or score in transition. He's a superb athlete. Guard Jordan Mathews is a shooting machine from deep. Przemek Karnowski (7'1", 300) and Zach Collins (7'0") are stellar twin towers for the Zags. Johnathan Williams, 6'9",228, is a highly athletic, tough rebounder and solid scorer. This team is for real. South Carolina is led by superb guard Sindarius Thornwell, 6'5", 211, a 20+ point scorer on a consistent basis. P.J. Dozier is another bigger guard, at 6'6", 205, who can score outside and inside, and both can really defend. Duane Notice, a 6'2", 225 guard, is a scorer and another stellar defender. The inside game is manned by 6'9", 223 pound Chris Silva, and valuable 6'10", 245 Maik Kotsar from Estonia, somewhere near Russia. So this Gamecock team has outstanding players and their run through this tournament with victories over Duke, a smashing win over Baylor and an Elite Eight victory over a very good Florida team has been spectacular. This is kind of the underrated matchup of the 2 games because of North Carolina's marquee name, but it's just as good a game. South Carolina is a phenomenal story. The Gamecocks were excellent in the SEC regular season, then hit a rut there at the end, but really recaptured their excellence in the postseason. I like South Carolina to really play well here. But Gonzaga is an amazing story too, and I really like their coach, Few. He's superb. I'm looking for a really close, more defensive-oriented game, with the Zags squeaking it out at the end. Roy Williams portrays himself as this folksy, Southern boy kind of guy, but it doesn't seem real. He's not the best coach in this Final Four. Mark Few is and Frank Martin is next. Williams is the third best. But he's won 2 national championships at UNC, which is very impressive. He won in 2005 and 2009, but when you have a roster full of McDonald's All Americans, that can really help your cause. Williams has that superb size and length up front in Kennedy Meeks (6'10", 260), Isaiah Hicks (6'9" 242), and a guy I would say is the best player in the country, Justin Jackson, who is 6'8", 210, and a likely top 5 NBA draft pick. He's a junior and better than the freshman who played this year, though De'Aaron Fox is one heckuva player at Kentucky. Joel Jackson is outstanding at point guard. Luke Maye is a superior 6th man, who is highly clutch, as his 18 footer to win the game at the buzzer against Kentucky last Sunday, 75-73, attests to. But Oregon has 3 prolific players as well. Six-foot-seven, 225 forward Dillon Brooks is a world class athlete and super clutch shooter along with being a fantastic defender. Six foot-four, 195 pound guard Tyler Dorsey is highly reliable from deep, like Brooks, and another world class athlete. Six-foot-nine, 225 pound center Jordan Bell posted 11 points, 13 boards and 8 blocks in a 74-60 Elite 8 victory over No.1 seed Kansas in the Midwest Region in a game which Oregon pretty much had control of throughout. They dominated because Bell was such an enforcer in the middle, and Dorsey poured in 27 points with Brooks adding 17. This team is the real deal on offense and defense. They miss some shots, but they are excellent on the offensive glass and seem to make shots when they really matter, particularly Brooks and Dorsey. This one is going to be one heckuva battle. I love what Oregon has done in the postseason. Beating Kansas was a real statement game. Carolina is the most talented team offensively in this tournament as they average 85 points per game, but Oregon holds teams to 65 points per game. Carolina has that length, but Oregon has so much toughness and heart that I'm going with the upset here. The Shell Houston Open features an all star field this week with names like Spieth, Mickelson, Rahm, Fowler and Reed. World No.1 Dustin Johnson, who just won the Dell Match Play in Austin last week with a 1 up victory over Jon Rahm, is taking this week off. Dustin never trailed in the 112 holes he played last week at the match play. Wow. He's the best right now and certain favorite heading into the 81st Masters next week. Dustin has won all 3 events he's played in this season; the Genesis Open, the WGC-Mexico Championship, and last week at the Match Play. Talk about stellar. Through the roof good. His length is always there, he's a surprising 2nd to Rory in driving distance at 316.2. Rory leads at just over 318. Both are totally large hitters. Dustin pulled out this week from the Shell Houston due to fatigue. He'll be ready next week for "The tradition unlike any other," as Jim Nantz says of the year's classic tournament. Defending champion: Jim Herman. Won in a pretty emotional way last year. Jim was emotional talking to Todd Lewis of Golf Channel after his victory. He had played in 112 tournaments before winning at Houston. He had even quit golf in 2004 to become a teaching pro. But he hung in there and kept scrapping, and his hard work paid off. The winner here if the player hasn't qualified for the Masters will get the last spot for the first major of the year. Weather: Thursday, Sunny, windy, S 15-28 mph. Friday: sunny, 86, 8-14 mph. Saturday: sunny, 83, 12-17 mph. Sunday 77, chance for severe weather, hopefully not. Today is pretty dangerous in Houston with a severe weather alert and a chance for a tornado. Hoping that won't happen also. TV: Thursday-Friday: Golf Channel, 3-6 PM CT, 4-7 PM ET. Saturday-Sunday: Golf Channel, 12-2 PM CT/1-3 PM ET. NBC: 2-5 PM CT/3-6 PM ET. Lengthy par 3. Big sand traps on both the right and the left. Getting in the left side bunker with a left side pin, will lead to a difficult up and down as the player will be short sided and not have much green to work with to make par. Challenging hole. Three shot hole for most players. Trees on the right and left if you draw it or cut it too much. Second shot needs to favor the right side close to a big bunker to have the best angle of attack to the green. Long green and pretty narrow and surrounded by sand. Birdie here is good and definitely attainable. Par is not terrible, though on Sunday the contenders will probably need a birdie. Herman shot 69,69, 67, 68 last year for -15 to win it. There's a fairway bunker on the left that the players will want to carry to have a good approach shot to the green. Clearing the bunker can be challenging and getting in it can be trouble because the face of it is very steep. Small green that has a fair sized bunker front left and a large bunker on the right. This hole, to me, is one of the toughest finishing holes on the PGA Tour. It's underrated in its difficulty. A lake borders the entire left side of the hole. The tee shot challenges the player to carry as much water as possible while avoiding the large bunker on the left side of the landing area. There is a large bunker on the right that will cause the player problems if he overcooks his cut. Can't overcook the right to left drive either, or you're probably going to be out of contention. The competitor's second shot needs to avoid the water on the left and the large bunker on the right. This is quite a finishing hole. I really love this hole, which will set up for key drama on Sunday. I would have picked Vegas for my sleeper, but I have somebody else in mind. Vegas can win this tournament. He's long, a good putter, and won the RBC Canadian last year with some stellar golf on Sunday. The 32 year old from Venezuela has 2 career victories on tour. To go along with the 2016 Canadian, he also won at the then Bob Hope Classic in 2011 in Palm Springs, now the Humana Challenge. Johnny Miller loved Wagner's mental toughness and clutch play 2 years ago when he lost to J.B. Holmes in a playoff here. The 37 year old won here in 2008 and he's a native of Amarrilo, so he knows this course well. Wagner also has won at the 2011 Mayakoba Golf Classic in Cancun, and at the 2012 Sony Open in Hawaii. Won the Honda Classic a month ago and playing well. Rickie has 4 PGA Tour victories, including the 2015 Players. The 28 year old from Murrieta, California is still knocking on the door for a major, and looks primed to potentially capture one this year. There have been 12 winners on tour this season who are in their 20's. Wow, these guys are studs. Not only the 20 year olds, but the vets too. The 23 year old has won 9 times on tour now, including a victory in February at Pebble Beach. Spieth is another player who is primed to win at Augusta National next week, which would be his 3rd major championship title to go along with the 2015 Masters and 2015 U.S. Open at Chambers Bay. Like where Jordan's game is at. The competition at Augusta National next week will be major league intense. Can't wait. I'm going with the 22 year old from Barrika, Spain by way of Arizona State University, who's making a huge statement this season as he's already won at Torrey Pines and had a masterful performance at the Match Play last week before falling to Dustin in the finals, losing to Dustin, who was 1 up. This guy is another guy who will for sure be in the thick of things next week. I expect greatness here. I see him capturing PGA title number 2 this season and having major momentum heading into Augusta National next week. Phil won the BellSouth Classic in 2006 at Sugarloaf, just outside Atlanta, part of his 9th all-time 42 PGA Tour wins, then the following week, moved over 2 a1/2 hours away and won at Augusta National. So there is precedent for winning the week before the Masters and then winning at Augusta National. Going with the Spaniard. I'm going with somewhat of a blast from the past. This 48 year old from South Africa shot 64 on the final day of the Puerto Rico Open last week to finish T-2nd, at -18, 2 back of winner D.A. Points. He's won 40 times as a professional including 7 times on the PGA Tour highlighted by the 2001 and 2004 U. S. Open titles. I like this guy to be a heavy contender this week and to possibly pull it off. The SEC has shown greatness in basketball this year's in the NCAA's. The conference is back, and cookin, with 3 teams in the Elite Eight. The conference has 1 team guaranteed for the Final Four, and shooting for a pair. It's been stellar. Here's a look at today's tremendous match-ups with predictions locked, loaded. It looked like a high level college team playing a Division 3 team. Gonzaga looks super and is a real threat to win it all. They made a serious statement last night. Gonzaga in the Final Four next Saturday vs the winner of South Carolina-Florida. Kind of a surprise here, but the way Oregon beat Michigan, I knew they'd be a highly difficult out for a Kansas team that looked like it was cruising right along heading into the Elite Eight. Josh Bell was a beast on defense and on the glass, finishing with 11 points, 13 boards and 8 blocks. He had the Kansas offense in disarray. Oregon moves on to Phoenix next Saturday to play the Kentucky-UNC winner. Bill Self and his Jayhawks once again can't get it done in crunch time. These 2 teams are pretty even in talent as they are both athletic, great defensive teams, and have some clutch shooters, South Carolina in Sindarius Thornwell, who averaged 21 points this season and posted 24 Friday Night in 70-50 blasting of Baylor. The Gators have 3 stud shooters in Canyon Barry, who averaged 11.6 ppg, and is as clutch as it gets. He had a huge block of Wisconsin's Nigel Hayes's attempt at a dunk late in overtime that was the game changer for Florida in their 84-83 victory. Chris Chiozza only averaged 7 points this season, but is also a big shotmaker and leader on the floor. He sank the game winning 3 at the buzzer in OT Friday Night. KeVaughn Allen finished with 35 Friday Night, wow, and averaged 14 points this season. He's another stud shooter, player. With that information I listed above, it looks like Florida would have the advantage coming into the game, but I'm going with the underdog in this one. The Gamecocks defeated Duke last Sunday Night, 88-81, then smashed Baylor, 70-50. I like Frank Martin better as a coach than MIke White at this point. He has experience in big games, and will make the right moves to get his team to Phoenix. This is a super matchup of the Blue Chips of college basketball. It's the Bluegrass State vs Carolina Blue. Superb players are all over these rosters. North Carolina is led by superstar and future high first round pick in June, Justin Jackson, who averaged 18 points this season and finished with 24 Friday Night in a 92-80 Carolina victory over Butler Joel Berry II is the team's quarterback as its point guard and can light it up, as he averaged 14 points this season and poured in 26 Friday Night, going 3-for-7 from trifecta territory. Then you've got that huge front wall of 6'10", 260 pound Kennedy Meeks, who averaged 12.5 ppg and 9 boards this season. You throw in 6'9", 242 pound Isiaiah Hicks, who posted 12 points and 6 boards this season, and 6'6", 211 pound forward Theo Pinson, who came in as a starter late in the season and averaged 6 points and 4 boards and can jump out of the gym. Carolina doesn't go real deep on the bench, but Luke Maye, a 6'8", 235 pounder, went for 16 on Friday Night and is a valuable 6th man. Kentucky counters that with the best backcourt in the country led by the awesome De'Aaron Fox, who averaged 17 points this season and is as fast as Calvin Ridley in the open field. De'Aaron poured in 39 Friday Night. Are you kiddin me? That's superb and it was the same night that former Wildcat Devin Booker, in his 2nd year with the Phoenix Suns, poured in 70 in a 130-120 loss to the Celtics. Fox is sensational. Malik Monk is pretty terrific too. Another freshman, like Fox, Monk averaged 20 points this season, and went for 21 Friday Night in an 86-75 victory over UCLA. There are other top shelf players in Isaiah Briscoe, another point guard, who averaged 12 points this season. Senior Dominique Hawkins comes off the bench and provides excellent shooting from the shooting guard position. Freshman Edrice "Bam" Adebayo is 6'10", 260, and is one kind'uh hoss. Bam averaged 13 points and 8 boards this season. Senior Derek Willis is another shooter at small forward who is valuable. This should be an epic. This is a tough call. UNC has the advantage inside and they are an offensive rebounding machine. But I'm going with Cal and the Cats to advance. Like Fox's and Monk's shooting to neutralize the towers in the middle for Carolina. Should be some offensive fireworks. The SEC has put on a clinic in this tournament. Last night, South Carolina, Kentucky and Florida pulled off impressive victories to move on to the Elite Eight Sunday. South Carolina dominated an overmatched Baylor team, De'Aaron Fox scored 39 to lead the Wildcats past UCLA and Florida won in overtime on a miraculous buzzer beating 3 by Chris Chiozza. It was a phenomenal night for the conference as the SEC is back in the thick of things in the college basketball landscape. I give a lot of credit to Commissioner Greg Sankey, and Mike Slive before him, who stressed getting SEC basketball back to relevance. And also, to the tremendous coaches in the SEC. Cal, Frank Martin and Mike White are 3 of the best in the country, though I did question White's late game management last night. North Carolina also advanced with a dominating performance over Butler. UNC-Kentucky @4:05 PM CT/5:05 PM ET will be a classic tomorrow on CBS. That follows Florida and South Carolina which tips off at 1:20 PM CT/2:20 PM ET on CBS tomorrow. Never really a contest. Sets up a blockbuster Sunday with two of the IBM's of college basketball, the Tar Heels and the Wildcats. These Gamecocks are for real. Baylor was horrible. The most interesting part of the game, except if you're a South Carolina or an SEC fan, was Verne Lundquist's identifying a guy sitting close to Baylor Coach Scott Drew's father, Homer, the former coach at Valparaiso,, as "Bryce Drew, the head coach at Vanderbilt." It wasn't even close. It was some Baylor fan who was wearing Baylor gear. May have been a family member, but it wasn't Bryce Drew. Nice job Verne. I will kind of miss him on college football Saturdays. He brings good humor to the broadcasts with his frequent mistakes. Still have Gary, unfortunately. The De'Aaron Fox-Lonzo Ball showdown was no contest. Fox was superb and Ball was barely noticeable. De'Aaron said after the game that Ball would probably be the first pick in the NBA draft. I disagree. It should be Fox. He's much better than Ball. Fox is not only a terrific player, but he's also a terrific young guy. Malik Monk is not too bad either. He finished with 21 and sank a couple of 25 foot trifectas in a row. It was beautiful. Canyon Barry and Chris Chiozza brought the Gators back from 5 down with a minute and a half left in the overtime, after the Badgers had tied it with 2 seconds left in regulation on a Zak Showalter leaning 3. Barry scored on a layup and blocked a Nigel Hayes breakaway dunk. It was a magnificent play. Florida tied it at 81 on a Chiozza layup. After Hayes hit a pair of free throws to put the Badgers up 83-81. Florida, with no timeouts left and 4 seconds left on the clock, got it in Chiozza's hands who drove the length of the court leaned into a 3 with his feet behind the arc and swished it at the buzzer. It was remarkable. Gators- Gamecocks tomorrow followed by the Cats and the Heels. Should be an epic day. Xavier was impressive in a 73-71 victory over Arizona Thursday Night. Gonzaga's 61-58 victory over West Virginia was even more impressive. Like these Zags. Their mental toughness and athleticism are second to none in this tournament. Don't know if they have the skilled talent to win it all, but they've got a shot. Like the Zags to get it done in San Jose, but not by much. Kansas looks unbeatable right now, but they haven't played the level of competition that Kentucky or Gonzaga has so far. And they are basically playing home games in this regional semis and now finals. They played in Tulsa last week and that's close to Lawrence, KS. as well. So they're not a guarantee in to win it all by any means. They face a pretty relentless defensive team in Oregon that can also score it pretty well at times. Like Kansas to win here and super freshman Josh Jackson and super senior Frank Mason III to have big games. But Oregon, with sophomore Tyler Dorsey and junior Dillon Brooks, are a tough out. I expect this to be close also. Ducks just defended and rebounded better than the Wolverines. Sank enough shots and won. Michigan didn't even come close to resembling the team that won in the first 2 rounds of the tournament. Not sure why not. I guess the Ducks defense confused them. They just didn't play aggressively enough on offense and take open 3's when they had them. Hard fought game that Gonzaga showed a lot of toughness and resilience in to prevail over a high level opponent. Kansas looked spectacular and unstoppable. Sean Miller fails to get it done again at Arizona. Like the height of UNC to get the job done here. Justin Jackson is an absolute stud for the Tar Heels. Expect him to have a huge game. I really like what Frank Martin has done in Columbia. He's built a super team this season and the SEC has 3 teams in the Sweet 16, all playing tonight, and that's a huge statement for the conference. The Gamecocks 88-81 upset victory over Duke was tremendous. But I like Baylor a little more here. Have a little more depth athletically and have been here pretty often. Expecting a very close game though. This could be the best match-up of the Sweet 16. It's a battle of stellar point guards in UCLA's Lonzo Ball and Kentucky's De'Aaron Fox. A lot of really good players around them too. Kentucky has a few more and Fox is superb. Like Ball too, but Fox will help get KY over the hump in a tight one. Love what the Gators did in the first two rounds as they blasted East Tennessee State in round one, 80-65, then dismantled fifth seeded Virginia, 65-39, in the second round. Like Florida to keep playing on Sunday. Really bullish on this Michigan team. They won tough, hard-nosed games against an excellent Oklahoma State team last Friday, 92-91, then defeated the always powerful Louisville Cardinals and Rick Pitino, the basketball genius, 73-69, last Sunday to earn the right to play in Kansas City. Oregon is an excellent team, but I like stud senior Derrick Walton Jr. and super talented Berlin Germany center Moritz Wagner (6'11", 240, pronounced Vaagner) to get the Wolverines over the top. West Virginia plays harassing defense that causes havoc for the opposing team. They turned over Notre Dame 14 times in their 83-71 victory last Saturday and ND is one of the best teams in the nation in not turning it over. West Virginia can also play some offense, too. They look pretty special. They'll have to stop Gonzaga's massive senior Przemek Karnowski (Poland, 7'1", 300) and super shooting guard Nigel Williams-Goss, but like the 3 point underdog to stop those two enough and their quickness and athleticism to win the game for them. The Jayhawks looked unstoppable last week in dominating Michigan State, 90-70, and this is basically a home game for them. Frank Mason III and Rock Chalk move on to the Elite Eight. Zona is a talented, tough team. Don't know if Sean Miller can get'em to the Final Four, he seems to come up short every year, but I like him and Zona in this game. Last week: Adam Hadwin captured the Valspar Championship in Tampa shooting -14. Arnie passed away at 87 years old last September. "The King" won 62 PGA tour titles which included 7 majors, the 1958, '60,. '62 and '64 Masters, the 1960 U.S. Open, and the 1961 and '62 Open Championships. He tied for 2nd three times at the PGA Championship, in 1964, '68, and '70. He left an indelible mark on the game which will always be remembered. Weather: Sunny throughout the weekend. Thursday, 64, Friday, 72, Saturday, 78, Sunday, 77. Winds 8-15 MPH throughout the weekend with the strongest gusts on Sunday at 12-15. Saturday-Sunday: NBC: 1:30-5 PM CT/2:30-6 PM ET. The beginning of a 3 hole stretch that is one of the best in golf. A sure birdie possibility and a legitimate eagle shot. The drive is tight though with trees and rough on the right and water on the left. There is a massive amount of water at Bay Hill. A narrow, but long green is guarded by water on the left for errant pulls, and sand on the right. It's a pretty tight landing area for a player's approach, which is usually his second shot. This is a good birdie opportunity as well, but can be treacherous too, and lead to an implosion for a contender on Sunday if he makes a mistake. A long tee shot from an elevated tee to a green that's surrounded by water on 3 sides with bunkers protecting the right side. The green is small by Bay HIll standards. While it can lead to birdies, it can also lead to 3 putt bogeys. If the player hits it into the massive trap in front of the green, he'll do well to get it up and down and avoid bogey. This hole will be high drama and pressure packed on Sunday and lead to one of the marquee holes in golf. The hole looks pretty straightforward from the scorecard, but it' anything but that. It's a blind tee shot to a pretty wide fairway, so that's pretty doable. But the 2nd shot has an extremely high degree of difficulty. The large, wide green is fronted by rocks and a substantial lake that will require a long carry to get the ball to the right half of the green where the pin will be placed up front on Sunday. The bunkers on the left are for the pull hooks and the water and rocks in front of the green make for a highly difficult, precise shot by the pros to get it in birdeable range. There will be some serious electricity and excitement at the 18th on Sunday. I know the players will be sorry Arnie can't greet them at the end of their rounds, but he'll be there in spirit. Will be epic. I'm going with the 27 year old from Salt Lake City to get it done at Bay Hill. I picked him earlier this year, I'm pretty sure at Torrey Pines, and it didn't work out, but I really believe in him as a possible elite player. He finished 5th last week at the Valspar Championship shooting a 64 on Sunday. He's long, and a tremendous putter. Like the young guy, who won the 2016 Puerto Rico Open, his only tour victory, to earn a huge victory at Arnie's place. The tour heads to San Diego and the historic Torrey PInes South Course for the Farmers Insurance Open. The defending champion is Brandt Snedeker. Sneds shot 69 on Sunday in basically a monsoon to capture the title for his 8th tour victory and 2nd at the Farmers. He also won in 2012. Tiger Woods returns to the tour after a 17 month layoff. He did play in his own Hero World Challenge where he finished 15th out of 17 golfers, but did lead the field with 24 birdies along with Hideki Matsuyama. His last PGA round was at the 2015 Wyndham Championship in August where he tied for 10th. He has won 8 times at Torrey, including 7 Farmers and his dramatic 2008 U.S. Open when it was heroic shot making after heroic shot making in which he played with a broken leg and torn ACL. Pretty miraculous. But it's been a long time for Woods, and the competition has even gotten more fierce with these 20 something studs along with the established players like Jason Day, Dustin Johnson, Sneds, etc... All three of those guys are in the field this week. Torrey South is a 7,698 yard, par 72 layout. It was opened in 1957 and designed by William Bell. In 2001, Rees Jones redesigned it which allowed the course to get its first major in 2008. Torrey South will also host the 2021 U.S. Open. Last week, Hudson Swafford won the Career Builders Challenge at the Stadium Course on PGA West in La Quinta, California. Also, Adam Hadwin became the 8th player in PGA history to break 60. Justin Thomas did it at the Sony Open in Hawaii two weeks ago, shooting 59 in the first round. Thomas leads the Fed Ex Cup rankings. He is followed by Hideki Matsuyama, Pat Perez, Brendan Steele and Mackenzie Hughes, all winners this season. Swafford moved to 6th and Hadwin, who finished second last week, is now 10th in the standings. Players will each play a round on the North Course on either Thursday or Friday. While the North is easier, it has been lengthened and with the 15 inches of rain the courses have gotten in January, it'll play a lot tougher The South could be a beast. Staying out of the rough is critical. The tour will rule tomorrow whether the first two rounds will be lift, clean and place because of the wet conditions. ***PGA rules officials have ruled that the players will play the ball up, and preferred lies will be in play, so the players get somewhat of a break with the soggy conditions. The marquee hole on the course is the 18th, a 572 yard par 5. If a player cuts it too much off the tee, he'll land in a trap leading to a very tough time at reaching the green in two. If a player hits it left, he'll have to contend with trees and will have to lay up too. When players go for it in two, provided they're in good shape off the tee, they'll need to clear a lake on the front left of the green. If they spin the ball too much on the green, it could go right back into the lake. It makes for some serious dramatics on Sunday and can lead to some thrills and some heartbreak for the players. Kyle Stanley had a three shot lead over Snedeker in 2012 heading into the 18th, but hit it into the water twice and ended up triple bogeying the hole allowing Sneds to get in a playoff with him, which Snedeker won. Weather, very good. Sunny 58-65 Thursday through Sunday. Winds anywhere from 11-15 MPH all four days, so the wind could cause some problems. TV: Thursday-Friday, Golf Channel, 2-6 PM CT/3-7 PM ET; Saturday, Golf 12-1:30 PM CT/1-2:30 PM ET, CBS, 2-5 PM CT/3-6 PM ET; Sunday, Golf Channel, 12-1:30 PM CT/1-2:30 PM ET; CBS 2-5:30 PM CT/3-6:30 PM ET. Phil won here in 2000 and 2001 and finished -11 last week, T-21, at the CareerBuilders. He still can go deep with the driver, so if he's accurate off the tee, and putts well, he's got a good shot. Dustin finished second last week at the Abu Dhabi HSBC Championship in the United Emrites, so he's playing well. He had a long flight to get back to Torrey Pines, but he's leading the tour in driving distance at 319. If he's accurate and gets hot with the flat stick, he could very well win. Lengthy off the tee, 307, and led the CareerBuilders after day 1 last week, but dropped off. Like his potential at winning in the next year or so. I'm going with a guy who's 10th on the tour in driving distance at 309. This course is already long enough at nearly 7,700 yards, and with the 15 inches of rain this month, it will be extremely lengthy this week. The rough is very thick, so length and accuracy are at a premium. The 27 year old from Salt Lake City won at Puerto Rico last year for his breakthrough victory. When he's on with his putter, he's exceptional. I like him this week.